Traci and I finally went on the Tom Joyner Foundation Fantastic Voyage Cruise. It's the ultimate "party with a purpose" cruise that raises scholarship money for students whose funds have run out at HBCUs (Historically Black Colleges and Universities). This trip totally exceeded my expectations. Basically, the Tom Joyner Foundation rents out the whole Royal Caribbean Adventure Of The Seas cruise ship and provides top-notched entertainers, activities, and parties that are catered to listeners of his radio show. 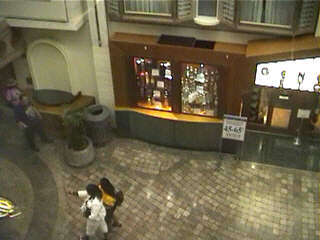 We saw many celebrities and met many nice people. Now I know why people go on this cruise year after year despite its hefty price tag. The Concerts: Without a doubt, this was my favorite part of the cruise. Every evening after dinner we went from venue to venue until the wee hours of the morning to see performers such as Chaka Khan, Freddie Jackson, Maze featuring Frankie Beverley, Keith Sweat, and more. Celebrity Sightings: We came face to face with more celebrities on this cruise than I have in my entire life. Some of the people we encountered chilling out on this cruise were Emmanuel Lewis, Brian McKnight, Minister Louis Farrakhan, and, of course, Tom Joyner. It was fun to see how many celebrities we could spot. Friendly People: We met so many nice people on this cruise. All the activities, concerts, and ports of call made it easy for everyone to strike up conversations with fellow passengers. We all seemed to bond as one big happy family. The Drink Tank: This was supposed to be a spoof of the more serious Think Tank discussion that took place on the ship. Instead of a panel of news anchors, actors, and politicians discussing serious social issues, the Drink Tank consists of a panel of foul-mouthed comedians who respond to the audience's questions with the most ridiculous answers they can think of. Ironically, the Drink Tank turned into a serious discussion as the panel of comedians opened up about their careers, idols, and opinions of the industry. It was a fascinating discussion. The Rock Wall: The ship has a rock wall. Traci and I had never done rock climbing before this trip but we gave it a try and enjoyed it. We made it to the top twice. It was a good upper body workout. Too Much Profanity: There were many comedians on the ship. They were usually the opening acts for the musical concerts. All of the comedians were very funny; however, I thought they used too much profanity. It seemed every other word was a 4-letter word or the N-word. It became annoying after a while. Standing in Lines: The evening concerts are first-come-first-serve. This led to very long lines. Some people told us they waited in line for 2 hours! To make matters worse, people were wrongly holding seats for their friends once they managed to get in the theater. Traci and I never arrived more than 30 minutes before a show. Because of this, there were times we were told that the venue was full. The event organizers did their best to accommodate the 3000 passengers on this cruise by staggering the shows and having most of the entertainers perform at least twice. Traci and I managed to see every show. However, standing in all those lines really began to frustrate us by the end of the week. Movie Screening: One of the perks of being on this cruise was that we got to see the screening of the movie Hustle and Flow. My problem with this movie is that we were on this cruise to be a positive influence on young minds by raising scholarship money, yet this movie has all the makings of a stereotypical, 1970's blaxploitation film with pimps, prostitutes, violence, jail, and filthy language. It seems to promote the negative stereotypes of blacks in film that so many people have struggled to change. 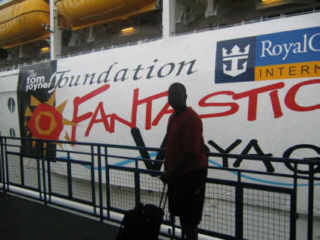 So many thoughts went through my mind as Traci and I stood there on the ramp looking at the huge "Tom Joyner Foundation Fantastic Voyage 2005" banner hanging on the side of this gigantic Royal Caribbean Adventure Of The Seas cruise ship. After years of not going on this cruise because of the price or because it was sold out, we were now standing just a few yards away from the entrance of the ship after finally committing to do the cruise almost 10 months ago. I was very excited, but also a little nervous. I'd heard this is a party cruise. I don't consider myself a party animal. Will I fit in? The cruise motto is What happens on the ship stays on the ship! What was I going to see on this cruise that I am not supposed to talk about? Just then, I felt a nudge. It was Traci who whispered, "Mike, isn't the guy in front of us one of the comedians from BET ComicView?" Sure enough, it was comedian A. J. Jamal. Wow! Our first celebrity sighting and we weren't even on the ship yet. I can't believe we're here! "Welcome to the Fantastic Voyage 2005!" We entered our ship cabin and found a bottle of champagne, a fruit basket, and a card from the Tom Joyner Foundation welcoming us aboard and thanking us for our contribution to the scholarship fund. These were the first of many gifts (shirts, duffle bags, hats, gadgets, etc.) that were waiting for us in our room each evening. 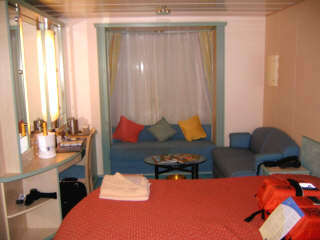 We had an inside cabin overlooking the Promenade Deck. Although it was one of the least expensive cabins on the cruise (but still almost triple the price it would be on a regular Royal Caribbean 7-day cruise - Ouch! 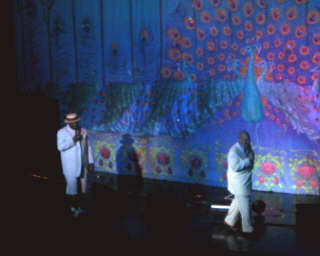 ), we later found it to be one of the best cabins to have on a Tom Joyner cruise. 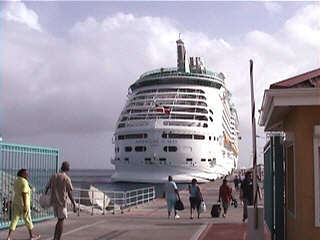 Many of the theme night parades and parties take place on the Promenade Deck. On these nights, we could simply open our curtains and see all the action instead of standing in the crowd hoping to get a glimpse. However, if you are a light sleeper, this is not the cabin for you. On the party nights, we could hear the music thumping and see the party lights flashing through our curtains at 4 a.m.. There ain't no party like a Tom Joyner party 'cause a Tom Joyner party don't stop! On our bed was a copy of The Compass, the daily newsletter listing all the ship activities and important announcements. As we read through The Compass, we were beginning to realize this cruise was not going to be like any cruise we've been on. Basically, Tom Joyner had rented the whole ship for a week and tailored the activities and entertainment to the demographic of the listeners of his radio show. Instead of the regular cruise ship evening entertainment, the evening line up included concerts like Chaka Khan, Eddie and Gerald Levert, Morris Day and the Time, and Kem. The morning exercise classes were being led by actual fitness guru's such as Donna Richardson, Mocha Lee, and Ryan Gentles. There were Think Tank discussions with panelists such as BET anchor Jacque Reid, Congressman Jesse Jackson, Jr., and actress Sheryl Lee Ralph to debate social issues. And, of course, there were plenty of parties. To further enhance the Tom Joyner experience, there was constant soft classic R&B music playing in the elevators and the dining halls. Some of the channels on the closed-circuit ship television showed movies that feature black actors and comedians. There were approximately 3000 of us on this Fantastic Voyage. The ages seemed to range from 30's to 60's with most people appearing to be middle-aged. The women greatly out-numbered the men.